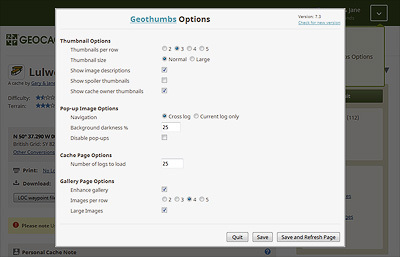 Geothumbs is a browser script that replaces the small picture frame icons on geocaching.com cache and logbook pages with thumbnails of the actual images. It adds image navigation and optional large images to the gallery pages. The script works with Firefox, Google Chrome and Opera. On cache and logbook pages clicking an image thumbnail will pop-up the full sized image in the existing 'lightbox' feature. Clicking the sides of this full sized image (or using the keyboard left and right keys) will allow you to move between all the images in the gallery. 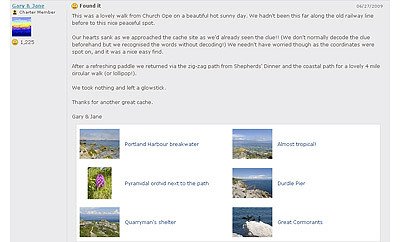 For images currently shown on the cache page each pop-up image will show the image title, who took it, when it was taken, any image description, a link to the cache log and a link to print the image. For images not currently shown on the cache page each pop-up image will show the image title, any image description and a link to print the image. 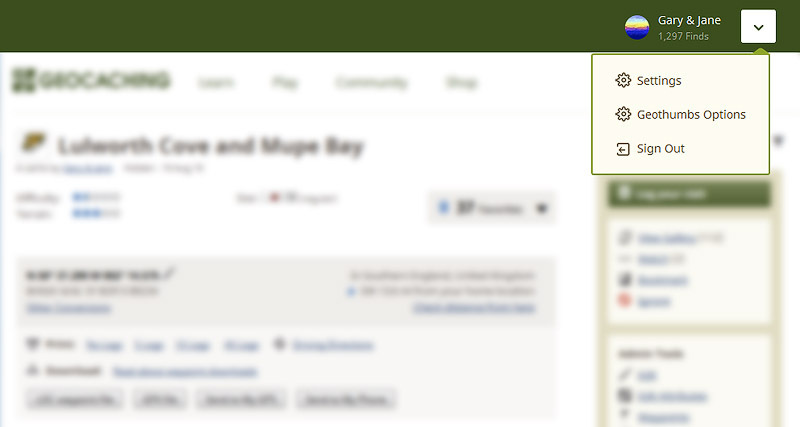 Clicking the text description next to the image thumbnail will bypass the 'lightbox' and display the image directly. To provide some protection against viewing spoilers inadvertently any image labelled as a spoiler will not be shown by default. This mode of operation can be changed to always shown spoilers. On gallery pages Geothumbs adds the ability to navigate between all the pop-up images in the gallery. The standard thumbnails can optionally be changed to large images if required. The number of images per row is also configurable. Geothumbs can load more than the standard 25 logs at a time when you initially open the cache page or you reach the bottom of the page. The number of logs that can be loaded can be configured to be 25, 50, 75 or 100. Geothumbs can be configured to your preferred operation by selecting 'Geothumbs Options' in the drop-down menu box shown to the right of your user name at the top of each cache page. If you use the GC Little Helper script then you will need to uncheck the 'Show Thumbnails of Images' and 'Show bigger Images in Gallery' options in GC Little Helper. Update to work with GC.com changes made in August 2018. Update to work with GC.com changes made in June 2018. Fix to display your own log and friends images when GC Little Helper II is installed. 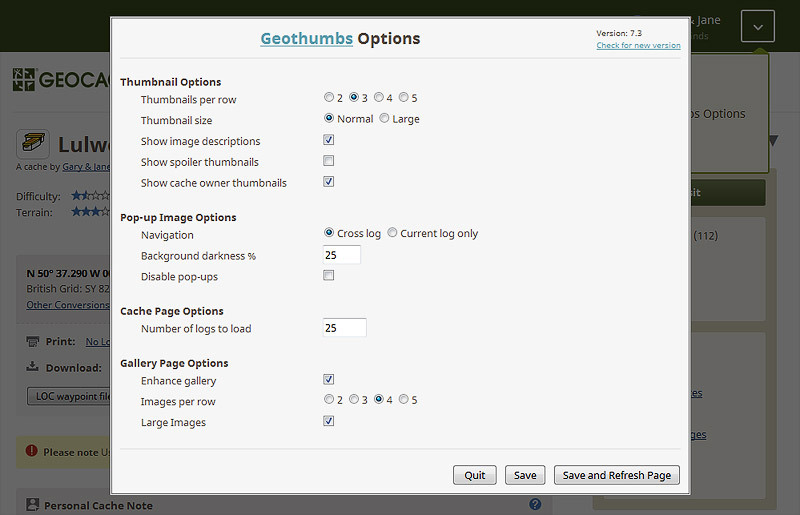 Enable geothumbs menu in Tampermonkey on Google Chrome. Fix problem where Geothumbs is non operational after reinstallation under Greasemonkey versions 2.0 onwards. Enable operation on old style /seek/cache_details.aspx cache pages.